The United States has more government debt than any other country analyzed, with nearly $20 trillion in gross debt in 2016. 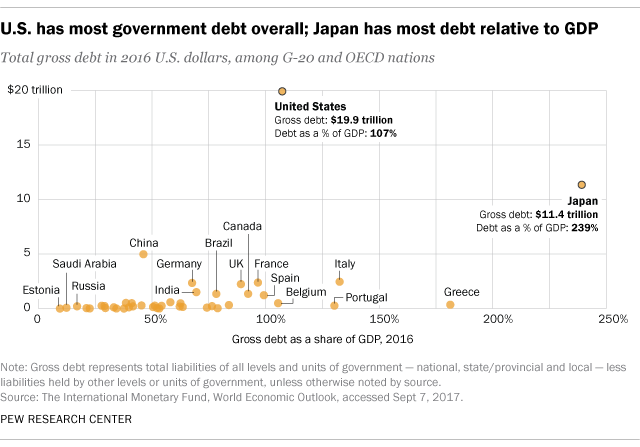 Japan was second, with 1,285 trillion yen (more than $11 trillion in 2016 dollars), followed by China with 34.5 trillion yuan (nearly $5 trillion). (Gross debt refers to all public debt – including intragovernmental debt, or what the government owes itself. Net debt, by contrast, is gross debt minus government assets related to debt, such as pensions for government workers.). "Modern slavery occurred in every region of the world," according to two reports released on Tuesday during the 72nd session of the United Nations General Assembly, and produced by the U.N.'s International Labor Organization (ILO) and the Walk Free Foundation, in partnership with the International Organization for Migration (IOM). 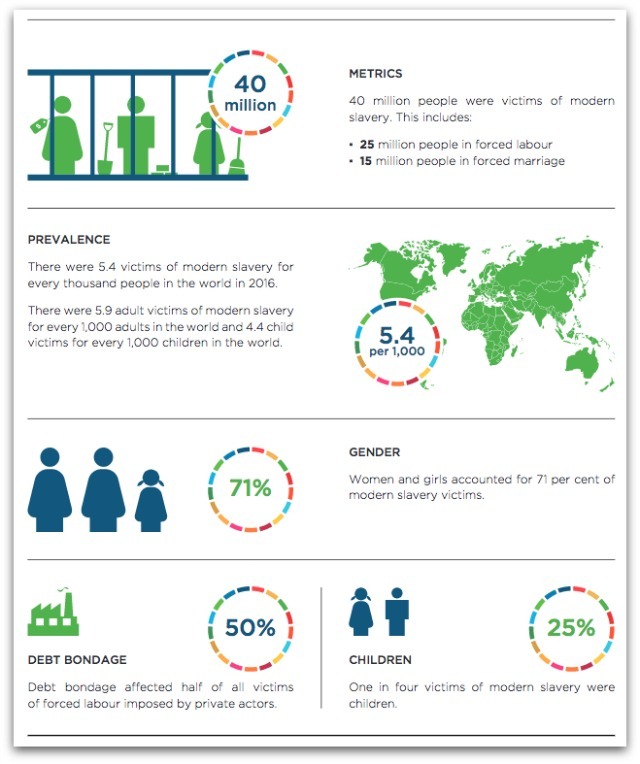 Of the 40.3 million victims of modern slavery last year, 24.9 million were in forced labor and 15.4 million were in forced marriages. The Energy Transition Outlook comes from DNV, a European-firm that provides independent assessments for both the fossil fuel industries (particularly oil and gas) and the renewable energy industry. You could say they have a foot in both camps. That makes its detailed forecast for the impending energy transition striking. It holds no good news for oil – it says that industrial production will peak in a few years and decline rapidly thereafter. Microplastic contamination has been found in tap water in countries around the world, leading to calls from scientists for urgent research on the implications for health. Scores of tap water samples from more than a dozen nations were analyzed by scientists for an investigation by Orb Media, who shared the findings with the Guardian. Overall, 83% of the samples were contaminated with plastic fibres. After steadily declining for over a decade, global hunger is on the rise again, affecting 815 million people in 2016, or 11 percent of the global population, says a new edition of the annual United Nations report on world food security and nutrition released today. At the same time, multiple forms of malnutrition are threatening the health of millions worldwide. For Extension faculty in Montana, ID, UT, WA, and WY, please register for our upcoming Montana State University Extension Community Development Update, Dec. 5-7 at Chico Hot Springs - Register here. NACDEP is now recruiting new members for its Board of Directors. Nominations will be accepted until November 10, 2017, and the ballot period will be open until December 13, 2017. Link to the Online Nominee Application Form here.